Updated on 8 March 2018: Added details on local price and availability. In addition to the faster Intel 8th-generation processors, they also now feature microSIM card slots and eSIM technology, so you’ll be able to stay connected all the time. 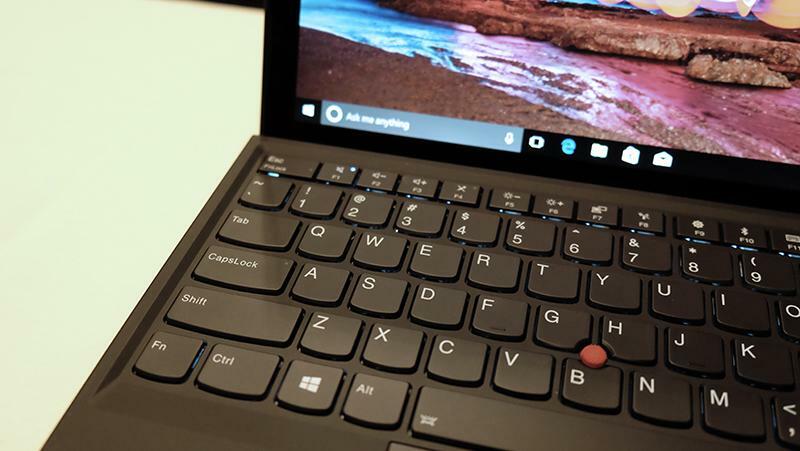 I’ve since managed to spend more time with the devices, and here’s a bit more detail on the new ThinkPad X1 Carbon, X1 Yoga, and the revamped X1 Tablet. The new X1 Carbon looks very similar to its predecessor, but there’s just one big difference – it now has a display that supports Dolby Vision HDR technology. This is a first for a laptop, and together with the X1 Yoga, it is the only laptop you can buy now that has this feature. I’ll be talking more about the X1 Carbon’s screen here, but my impressions apply to the X1 Yoga as well. In short, the screen is gorgeous. It’s something that needs to be seen in person, because pictures don’t quite do justice do it. With deep blacks, rich colors, and a wider color range, the 14-inch IPS display is a huge step up from any laptop. This comes across in the smallest things. For instance, when set beside an X1 Tablet with a non-HDR display, the blues in the water on the X1 Carbon had noticeably gentler and more subtle gradients. It also offers 100 per cent coverage of the AdobeRGB color space, so it’s a great option for professionals who work with photos and videos. You’re probably surprised that this was achieved without an OLED display, especially considering that that was offered on the X1 Yoga (Gen 2). But while the current screen may not be as eye-popping as a true OLED display, Lenovo says it’s learnt from experience that OLED displays aren’t actually the best for laptops, partly because of higher power consumption. 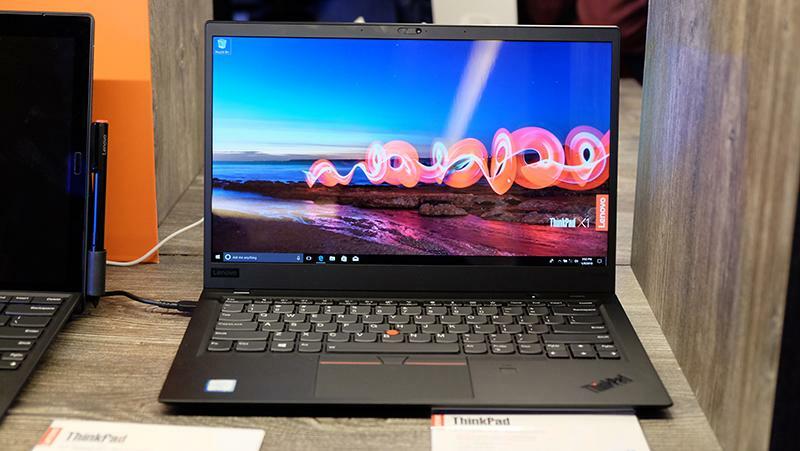 The LTPS (Low Temperature PolySilicon) display Lenovo uses has a peak brightness of 500 nits, significantly brighter than most notebook screens. It also achieved this without requiring trade-offs in terms of battery life, slimness, or bezel size, which is pretty impressive. The HDR model features a crisp 2,560 x 1,440-pixel resolution, but there’s also a lower resolution FHD option available without HDR. You can configure the laptop to have a touchscreen as well, unless you want to spring for the HDR version which doesn't support touch. The laptop feels blissfully light at 1.13kg, and while it isn’t quite at the bleeding-edge of thin designs at 15.95mm thick, I found little to complain about. Design-wise, the 2018 model also sports a new soft-feel matte cover that feels quite a bit better than before. One thing I really like is the use of one of the two Thunderbolt 3 ports for charging. 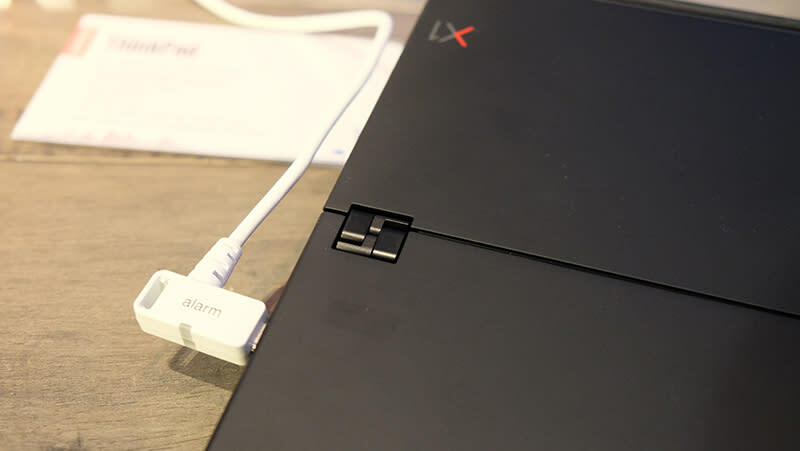 Lenovo now uses a USB-C charging port for all its 2018 ThinkPads, and I can’t see anyone missing the proprietary charging port. You’ll also find two other USB 3.0 ports, a headphone and microphone combo jack, one full-sized HDMI port, and a 4-in-1 microSD card reader at the back. 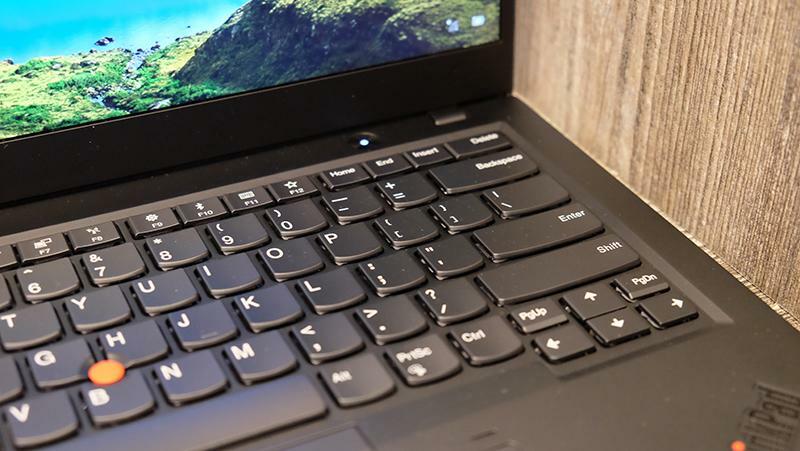 The lack of an SD card slot is a pretty glaring omission on a notebook that lends itself so well to photo and video editing, and it’s really a pity that Lenovo didn’t include one. Another nifty feature is the new docking connector, which features a clever self-leveling mechanism that supports multiple system sizes at different docking angles. 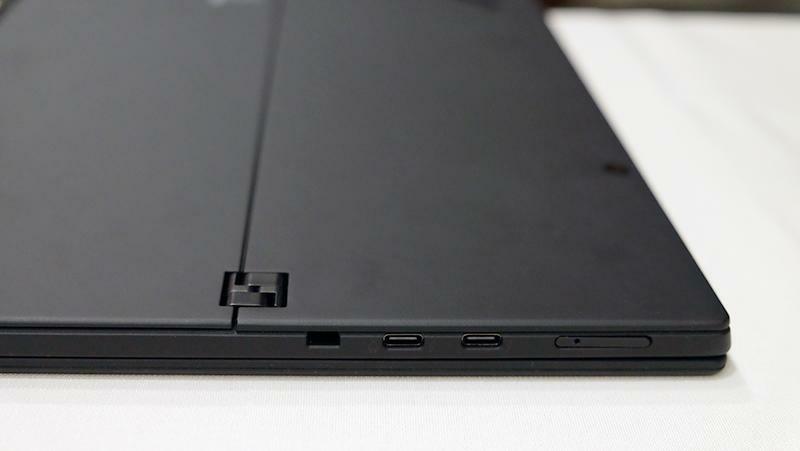 This enables a single docking interface across multiple products, and supposedly lets Lenovo create even thinner systems. 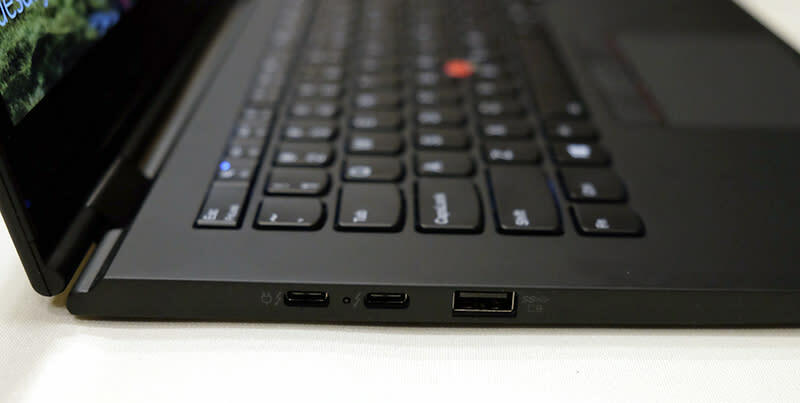 2018’s ThinkPad X1 Carbon comes with dual 360-degree far-field microphones as well, so it can pick up your voice from up to 4m away. If you don’t like Cortana, Lenovo will offer the Amazon Alexa app for PCs by the end of January, so you can talk to Alexa instead. In addition, RapidCharge has been brought to the X1 family, which allows you to get to 80 per cent charge in 60 minutes using the 65W AC adapter. Lenovo is also claiming up to 15 hours of battery life on its 57Wh battery, but I’ll have to test this out for myself. 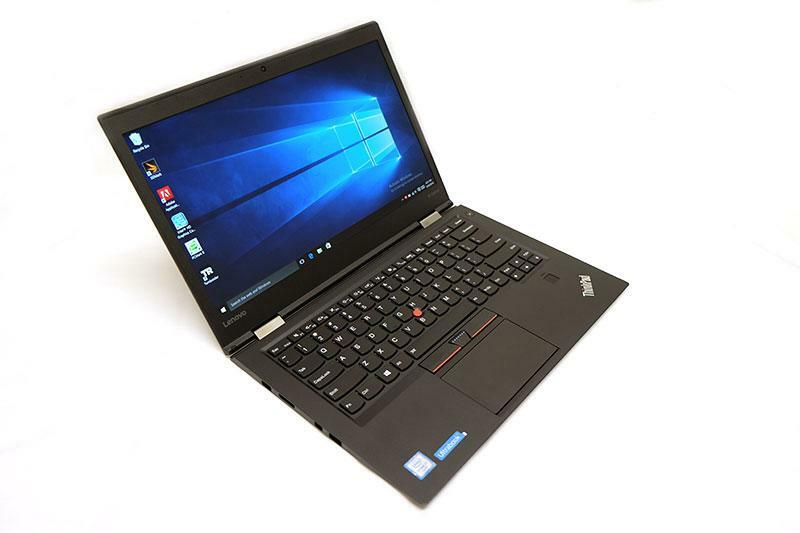 You can get the X1 Carbon with Windows 10 Pro (64-bit) and equip it with up to an 8th-generation Intel Core i7 vPro processor, 16GB of LPDDR3 2,133MHz RAM, and a 1TB PCIe SSD. It starts at S$2,999, and will be available to buy here come 18 March. 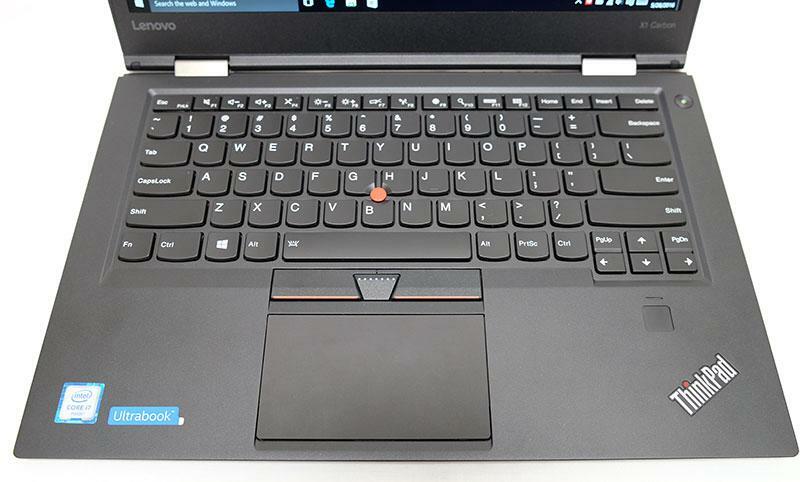 The X1 Yoga is pretty similar to the flagship X1 Carbon. 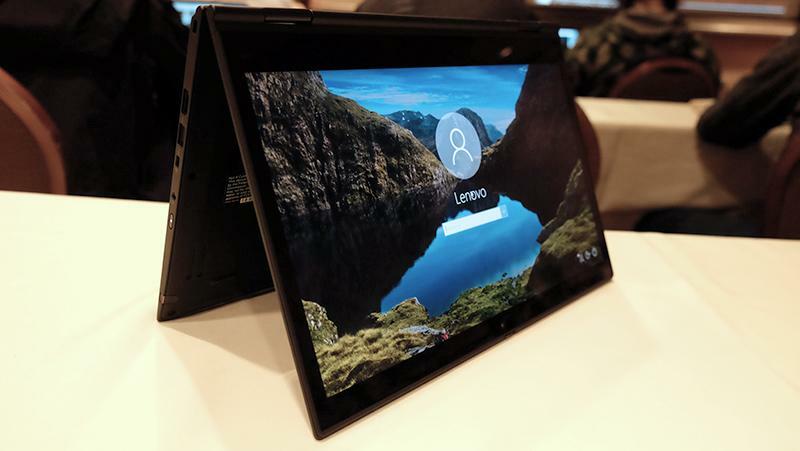 The two share very similar designs, specifications, and even the 14-inch HDR display, but the key difference is obviously the 360-degree hinge on the X1 Yoga. It can be folded over and used in a variety of modes, and the hinge feels super sturdy. 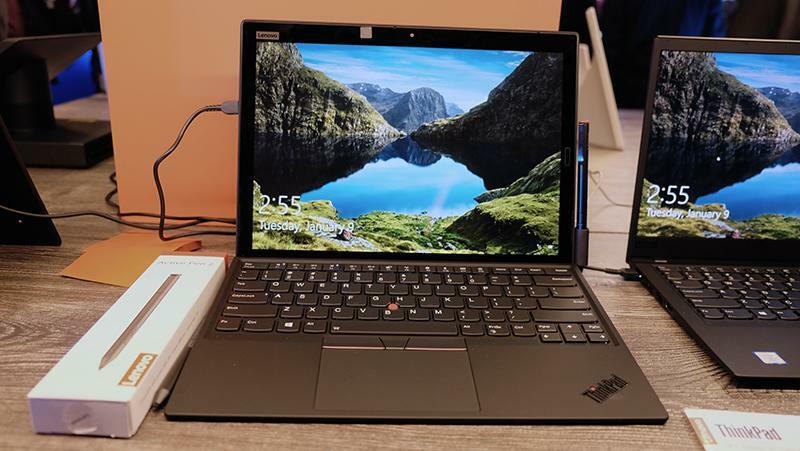 It sure seems like it’ll hold up under heavy use, and it’d better to that too considering that the X1 Yoga starts at a hefty S$3,499. 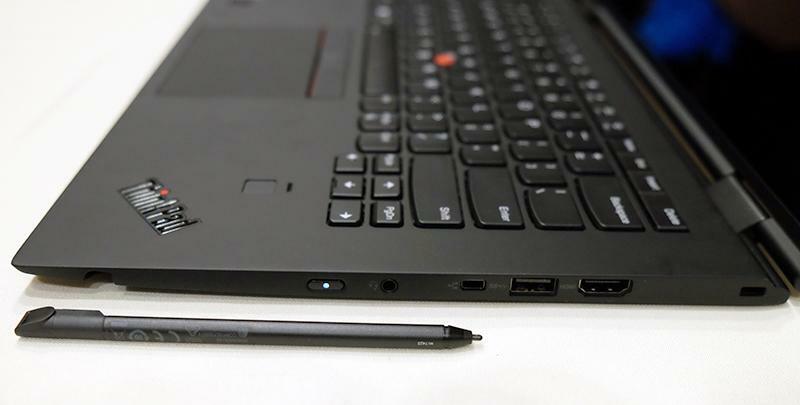 As on the X1 Carbon, build quality feels excellent, and it feels every inch the premium business notebook that it is. The convertible is slightly thicker and heavier than the X1 Carbon, weighing 1.4kg and measuring 17.05mm thick. The extra weight is definitely perceptible, but that’s the price you’ll have to pay for the versatility of the form factor. 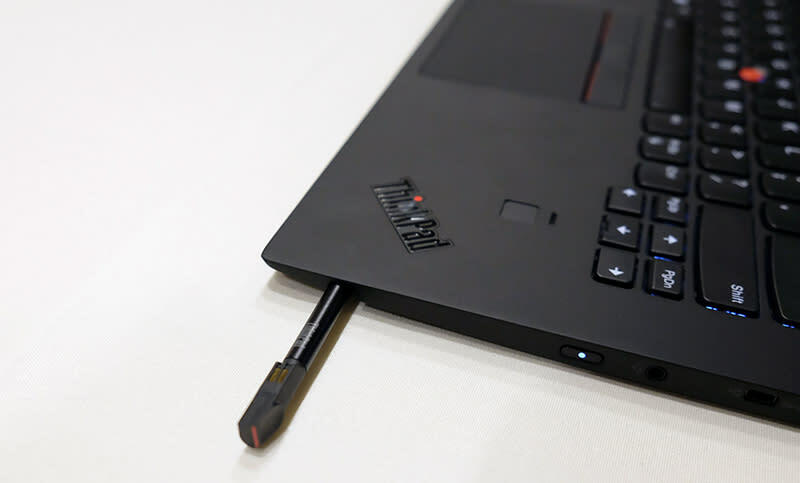 It also comes with a ThinkPad Pen Pro stylus that slots into a niche on the right of the notebook when it’s not in use. Anyone who has ever misplaced their stylus will appreciate the inclusion of the storage slot, and there aren’t even that many notebooks that offer this. The keyboard feels similar to the one on the X1 Carbon. Both are touting a 1.8mm key travel distance, and were quite a joy to type on. I’ve pretty much gotten used to shallow travel distances on most ultrabooks, so it’s always a nice surprise when a product decides to focus more on the keyboard. The selection of ports and connectors is nearly identical to those offered on its laptop counterpart, and you’ll find two Thunderbolt 3 ports, two USB 3.0 connectors, a headphone and microphone combo jack, a 4-in-1 microSD card reader, and a HDMI output. The only difference is the lack of the dedicated docking interface (and the addition of a native Ethernet port), so you won’t be able to take advantage of the new docking connecter. You can equip it with up to an Intel Core i7 vPro processor, 16GB of LPDDR3 2,133MHz RAM, and a 1TB PCIe SSD. RapidCharge technology is supported as well, and Lenovo is claiming up to 15 hours of battery life on its 54Wh battery. 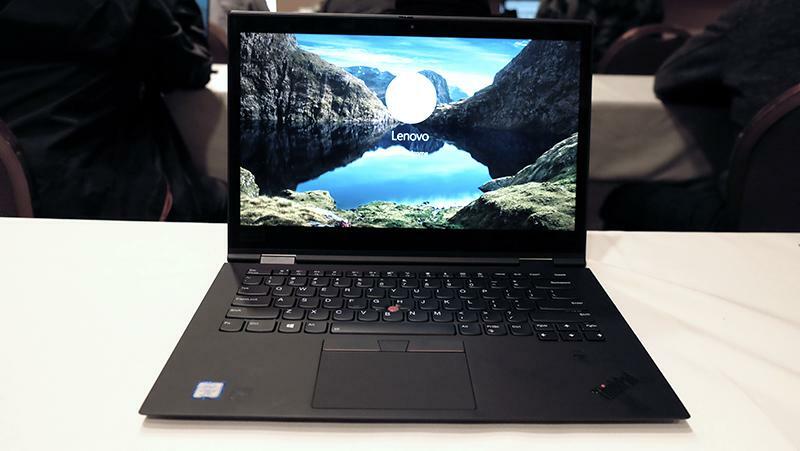 The third-generation ThinkPad X1 Tablet sees the biggest overhaul out of the three X1 devices. While its predecessor touted support for modular accessories like a projector or battery pack, the new X1 Tablet ditches all that in favor of a significant spec bump. While the old X1 Tablet came with a middling 4.5W Intel Core i7-7Y75 processor, the new model makes the leap to a quad-core 15W Core i7 chip. The performance gap should be huge, and the X1 Tablet is finally ready to handle more demanding computing tasks. In addition, you get 16GB of RAM and a 1TB PCIe SSD, so this is a full-fledged Surface Pro competitor right here. The 12-inch 2,160 x 1,440-pixel display has also been upgraded to a larger 13-inch panel with a higher 3,000 x 2,000-pixel resolution. It preserves the same 3:2 aspect ratio, which provides more vertical screen real estate for viewing documents. There’s no option for an HDR display here, but the X1 Tablet’s display is definitely good enough in its own right and I didn’t find it lacking in brightness or having too muted colors. The kickstand on the tablet allows the tablet to lie almost completely flat, and the hinge offers the full range of movement without the limitations of a set number of positions. The hinge incorporates elements of Lenovo's watchband hinge, and it feels sturdy with just the right amount of resistance. 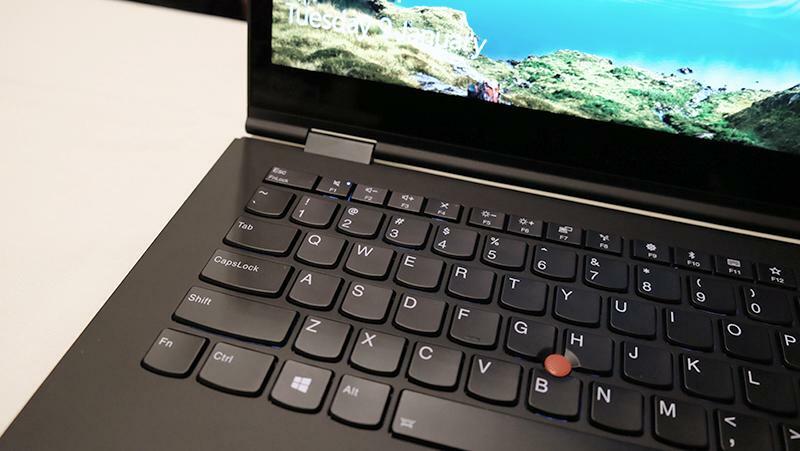 The hinge incorporates elements of the watchband design found on Lenovo's more consumer-facing Yoga products. The keyboard has also been stiffened to feel more like that on a real laptop, and the 1.5mm key travel distance was a pleasure to work with. 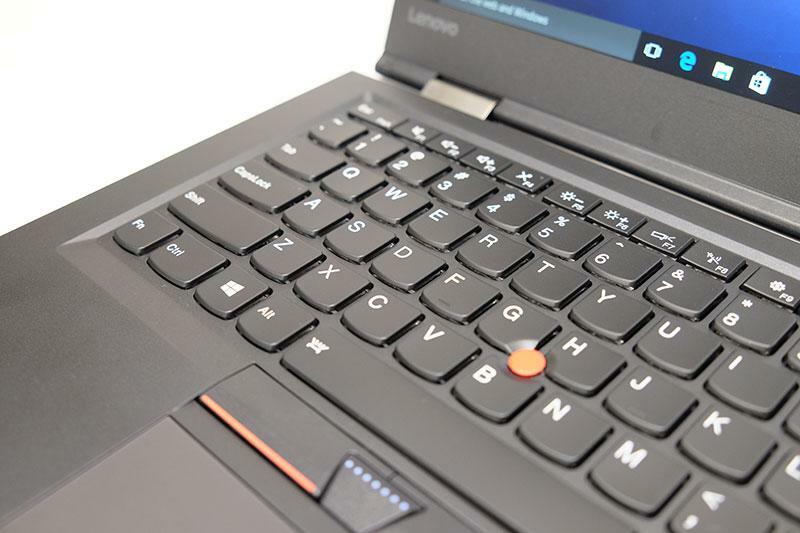 It’s also nice to see the same trackpad as on the X1 Carbon and Yoga, with the same dedicated left- and right-click buttons and TrackPoint pointing stick. The tablet comes bundled with a stylus as well, which clips onto the side via a holster of sorts. 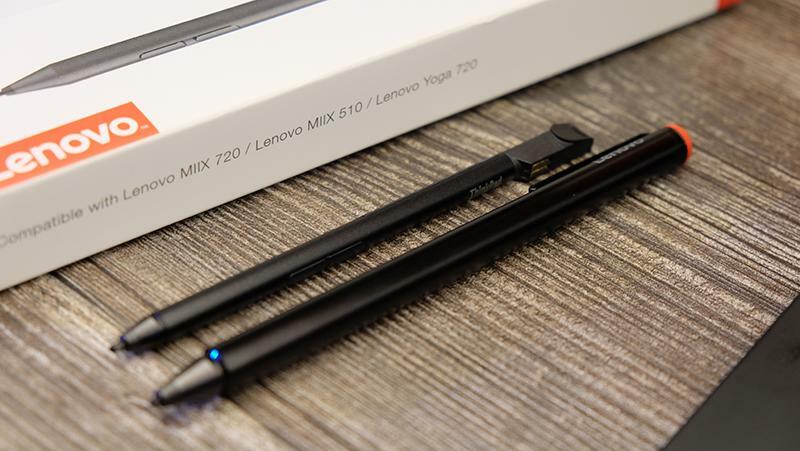 The pen is thicker than that on the X1 Yoga, and supports up to 2,048 levels of pressure sensitivity for greater precision when sketching or writing. Its larger size also means it's easier to handle and write with. The stylus on the X1 Tablet (right) is thicker than the one included on the X1 Yoga. 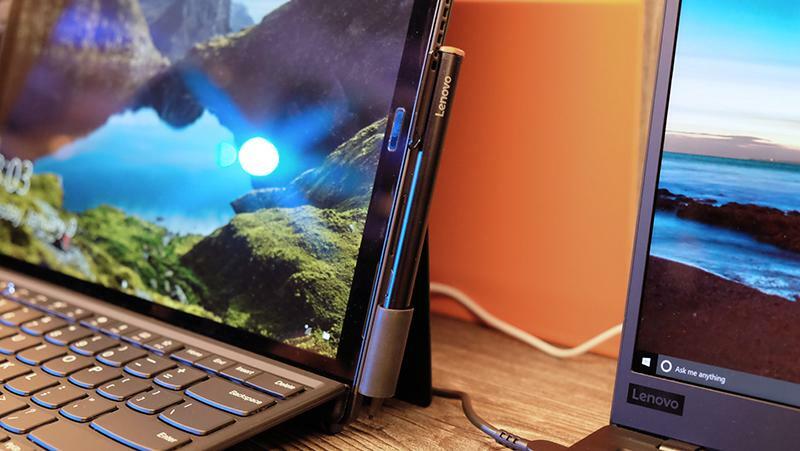 When it comes to ports and connectors, the X1 Tablet comes with two Thunderbolt 3 ports, a headphone and microphone combo jack, one 4-in-1 microSD card reader, and a nano SIM slot. The X1 Tablet will retail at a starting price of S$2,999.